Critiquing another chapter for a friend and reading a completed manuscript for another friend. Buying and mailing a birthday present for my other nephew – sorry buddy, it’s going to be late! Doing my taxes – gah, still not done! Instead, I went for a stroll in the sunshine with a friend and took lots of blurry photos of birds. This one I’m sharing is a red-winged blackbird. After a long stalemate, he agreed to let me take this one picture, so long as I hurried on my way afterwards. Alright, alright, this week’s tip? » Make a public commitment to your goals. Whether that’s a list of to-do’s on your blog/FB/Twitter, a note on your fridge door, or a sticky note on your computer monitor, write it down somewhere. So tell me, did you try out Trello last week? What did you think? Or do you have another list-making app that’s better? Tell me, tell me. ‹ Create a video book trailer – Contest! 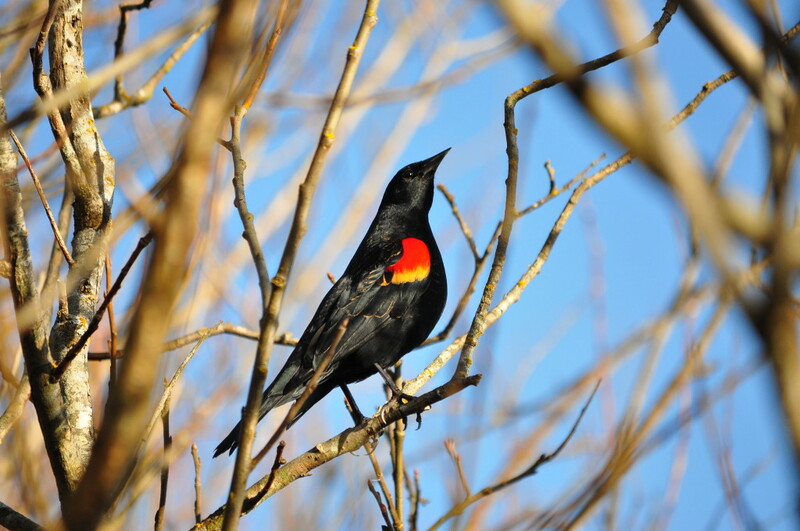 That’s an incredibly impressive picture of a red winged blackbird! And there is nothing better than finishing a ‘to do” then crossing it off the list! Good luck with your list! It’s true – crossing things off is satisfying! Great picture. Blurry can be “artistic”, and is definitely good for backgrounds. It really makes your centre of interest stand out. Thanks 🙂 I love the Voice. All those people with dreams who are taking a huge and public step to move forward. I think it’s a brave thing to do with so many people watching.